Yuppie chow. Rabbit Food. Microgreens. All the same thing- bags of tiny salad mix work out to 20 bucks a pound, but really, you can grow this, right now, on your kitchen counter. 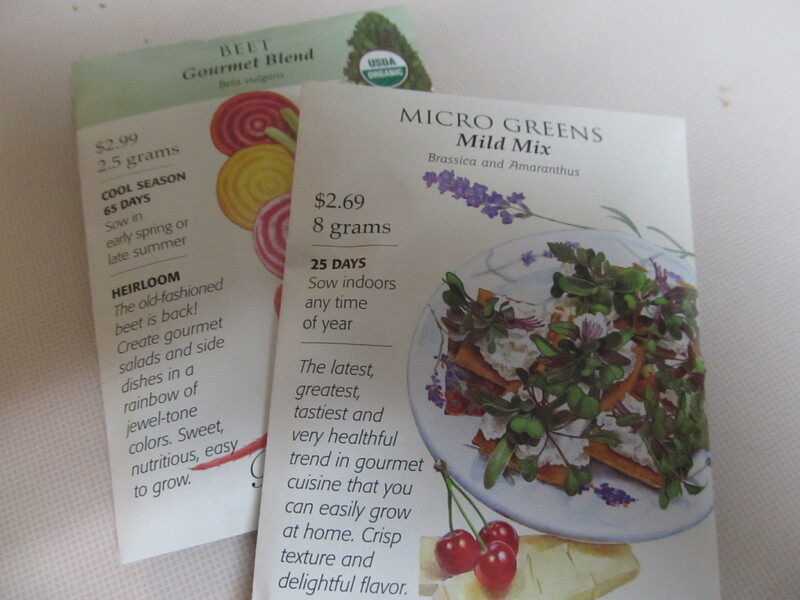 I got a packet of seeds at the store- Botanical Interests is a local company. Their “mild mix” has beet, red cabbage, kohlrabi, pak choi and swiss chard in it. The sprouts are supposed to emerge in 5-10 days, and the leaves are ready to pick in around 25 days, once they get 1-2 inches tall. You can cut them, toss into a salad or onto a sandwich, and the plants keep growing there in the pot. A few days later, there is enough for another salad- theoretically. I put them into a 6″pot on the kitchen counter- they don’t need much light until they sprout, and once they sprout, I’ll move them to where they’ll get more light. There is enough in the package for a whole flat, but I don’t want to give up that much space for it. It suits me better to get a pot going now, then start another in a few weeks, that way as the first pot is petering out, the new one is coming into production. As the weather gets warmer, I can grow this same mix outside as well. So can you- you can grow this. 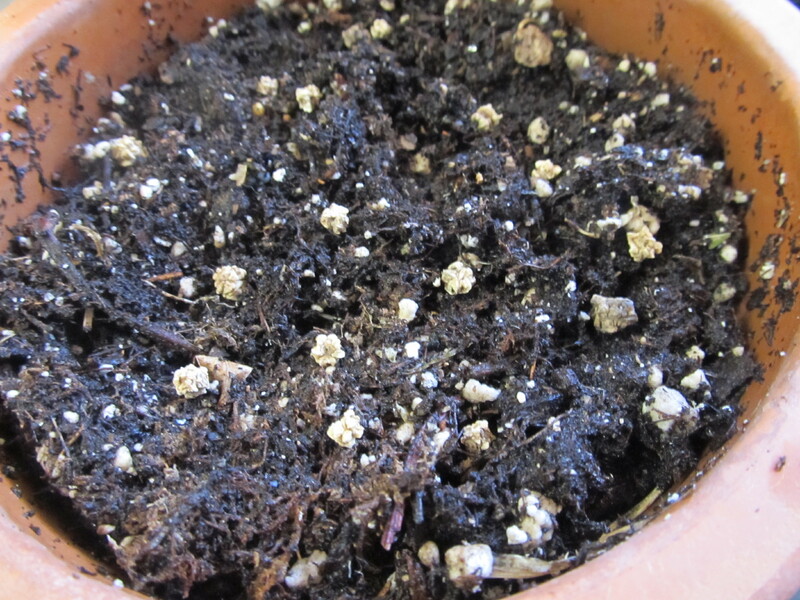 I scattered the seeds thinly on moist soil, and I gently spray it twice a day with the kitchen sink sprayer. Previous Becoming Handy Next The Bathroom Remodel? This sounds like a really interesting mix from BI, I’ll have to check it out. I have to admit, I don’t get the microgreens thing. A couple of the farmers in our town are growing them due to chef demand. With this mix though, it does sound slightly more appealing! BI has a spicy mix, too, that I think I’ll pick up. I complained to a friend about not liking beets, but liking beet greens, and she told me they tasted exactly the same. Maybe I’ll just have to open my mind to beets. I love the simplicity of a pot of greens. So simple but so delicious. Enjoy! Very nice idea and thanks for sharing! thanks! I’ll update when they are big enough to eat. I love the taste and look of micro greens on dishes at the nice restaurants. I’ll give this a try. Delicious, healthy and fun to grow. Great combo! That’s such a great idea, to grow one pot at a time, and have them on hand so they are ultra-fresh. Greens of any kind are great! I think that when plants first sprout they have more concentrated nutrition and enzymes and thats why people are into the micro greens thing. Sprouts are great too! Awesome! Instant salad! Be sure you post when they sprout. I want to see!